Lesser celandine, Pilewort, Smallwort, Brighteye, and Cheesecups. 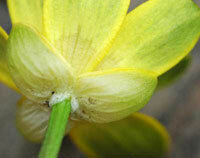 aka : Ficaria verna, formerly Ranunculus ficaria. This is a woodland plant that emerges early in Spring before the tree canopy forms - so it can take advantage of the light. It may also be found in hedgerows, the sides of streams and churchyards. Generally speaking, it 'likes' moist, damp soils. Small, underground cream coloured tubers (sometimes called tubercles) give rise to dark green, heart-shaped leaves with long leaf stalks (petioles). 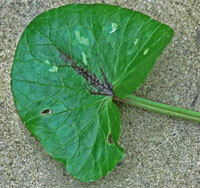 The leaves sometimes have light and dark patches on them - see adjacent photograph. Like some other members of the buttercup family, it has highly reflective yellow petals. Often eight petals to each flower, but the number may vary between seven to twelve. The epidermal (outer) cells of these petals are filled with pigment, and the cells beneath are packed with white starch grains – which probably contribute to their bright and shiny nature. As they age, the petals sometimes fade becoming white. Each flower has 3 sepals (seen in photograph). After flowering, the plant dies back. The plant was originally named a celandine because its flowers resembled those of the greater celandine . Botanically speaking, the greater celandine is very different and a member of the Poppy family. 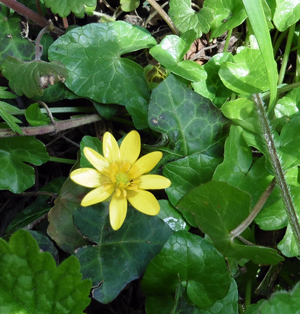 The lesser celandine is a member of the buttercup family (Ranunculaceae) and like many plants belonging to this family, it is toxic. The appearance of its underground tubers may have given rise to one of the names for this plant - pilewort. In the past, the use of a particular plant in herbal medicine was often assigned using the 'doctrine of signatures’. This suggested the use of a particular plant could be determined by looking for the sign or 'signature' that God had provided as to the use of the plant. Its flowers provide some colour in woodlands in early Spring, and 'ports of call' for early insects - bumblebees etc.